Kuala Lumpur, Malaysia -- When destiny knocks, it’s futile to run. A Tibetan master and his wife finally surrender their only child to lead the Drukpa (or Sky Dragons) lineage. << Life of discipline: The 12th Gyalwang Drukpa was recognised as a spiritual leader of a lineage when he was only two years old. NOT every parent will give up their child on demand. Not even a Tibetan master whose firstborn has been identified as the spiritual head of a lineage. Bairo Rinpoche, a reincarnate lama, and his wife, could not bear to be apart from their only son, who, at two years old, was recognised as a reincarnation of the founder of the Drukpa lineage, Tsangpa Gyare Yeshe Dorje (1161-1211). Reluctant to surrender the child, the couple fled to Nepal and went into hiding for “six or seven months” before returning to India. “My parents didn’t want me to be recognised as a reincarnation of a spiritual master,” said the 12th Gyalwang Drukpa or spiritual head of the Drukpa lineage. Speaking fluent English, the 47-year-old was in Malaysia for a week to impart his teachings in conjunction with the 800th year celebrations of his lineage. 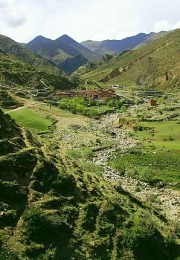 Bairo Rinpoche is a former abbot of Kathok Zhichen Monastery in Kham, eastern Tibet. A Dzogchen master, he is said to be the 36th reincarnation of the Pandit Vairochana, a disciple of Guru Padmasambhava (a Buddhist master) and renowned translator. The present Gyalwang Drukpa’s mother, Mayumla, is the daughter of a yogi, and a disciple of many great lamas. The religious men approached many great masters, including the Dalai Lama, and wrote to his parents to give up their “special baby”. After much pressure, the parents finally acquiesced. A day before the religious search team came to their home in Dalhousie, India, the little boy had predicted the event to his parents. “My uncle told me that I informed my parents, ‘Tomorrow, my people are going to pick me up. I’m going back to my home’,” he said. He told his father about a man with a white beard (the first Thuksey Rinpoche) who was coming to take him to his monastery. “I was feeling pretty positive. 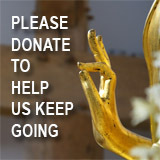 I had a sense that I was going home,” said Gyalwang Drukpa. At that time, he recognised and called by name some former servants and disciples of the previous Gyalwang Drukpa. He also correctly identified some of his predecessor’s belongings. In 1963, at the age of three, he was enthroned as the new spiritual head of the Sky Dragons lineage at the late Khamtrul Rinpoche’s monastery in Dalhousie. A year later, he was enthroned again at his own Dotsok Monastery in Darjeeling, West Bengal. The Gyalwang Drukpa has since re-established a home for the Drukpa lineage in Darjeeling and Kathmandu. Other than the monasteries located in the Himalayan region, many centres have been opened in Western countries and the Far East. 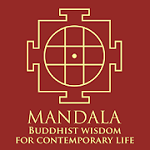 There are about 10 main lineages and 20 sub-lineages in Tibetan Buddhism. The Drukpa lineage, with its 800-year legacy, is one of the oldest. “The big crowd – people rushing, crashing into each other and crying with joy – scared me to tears. Otherwise, I do not remember crying when I parted with my parents,” said the Gyalwang Drukpa. During the enthronement, he had to sit for about six hours, with only a small toy deer to distract him. At six, he studied the Dharma; he had it memorised at nine. By 14, he had memorised all the Buddhist texts. He had eight tutors, and study hours were from 6am to 9pm with a lunch break. If he was being punished, there would be no lunch break and he might get “a smack”. Did he feel like a prisoner in the monastery? When he was 19, he started assuming responsibility as spiritual leader. His duties required him to travel around the world. The 12th Gyalwang Drukpa was born at Lake Rewalsar (the Lotus Lake) in northern India. The birth took place during a major ceremony of lama dances and a holy feast celebrating the birthday of Guru Padmasambhava. It was the auspicious 10th day of the first month, a sacred day in the Tibetan calendar. 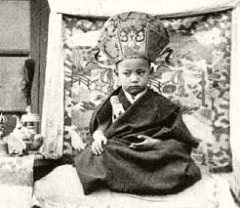 << Enthronement: Gyalwang Drukpa sitting on the throne at age four. Several propitious omens occurred before and during his birth, according to the website dedicated to his lineage (www. drukpa.com/gdrukpa/gdrukpa_main.htm). During his mother’s pregnancy, it was said that his parents often heard the chanting of the Amitabha mantra coming from inside the womb. Apparently, too, there were thunderstorms, snow, a rainbow, and other signs “to celebrate his birth”. By burdens, he meant his responsibilities to “hundreds of monasteries and hundreds and thousands of people, including monks and practitioners”. He reckoned that his responsibilities are heavier these days. “The lineage is in trouble,” he said, adding that it is getting less help and support from the people. There are fewer teachers as many old ones had died. The founder of his lineage saw nine dragons and thus named the lineage after them. The Drukpa lineage allows him to continue the bloodline, such as getting married and procreating. Reflecting on everything that has happened, he said, “I have no regrets. I was not appreciative when I was younger but now, I am. Devotees claimed that the present Gyalwang Drukpa is responsible for miracles in places he has visited. For instance, some claimed that in drought-stricken areas, it would rain after his visit. When asked, he did not stake any claim to the so-called miracles attributed to him nor is he egoistic about them. He merely said that he gave his “best wishes to benefit all sentient beings”. “Miracles do not need to be performed. If you perform miracles, then it would be a performance,” he said, adding that miracles happen almost naturally.